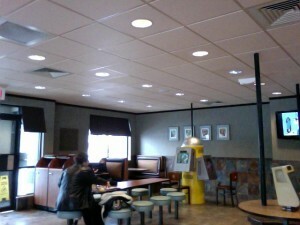 I’m sitting in a McDonalds’ at the moment working remotely via the free Wifi at this golden arches. 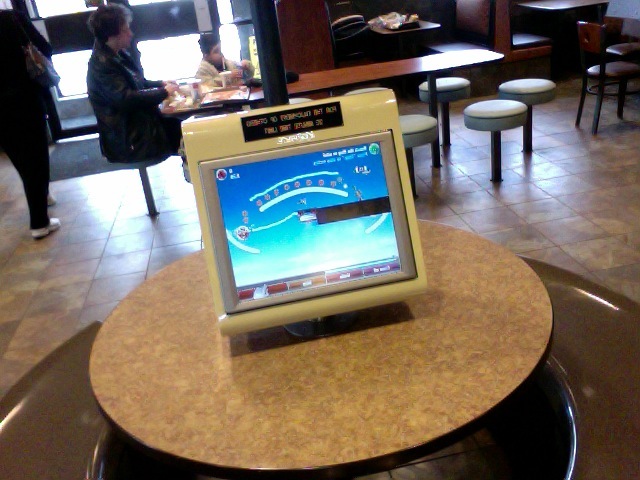 Yes, free Wifi at McDonalds. 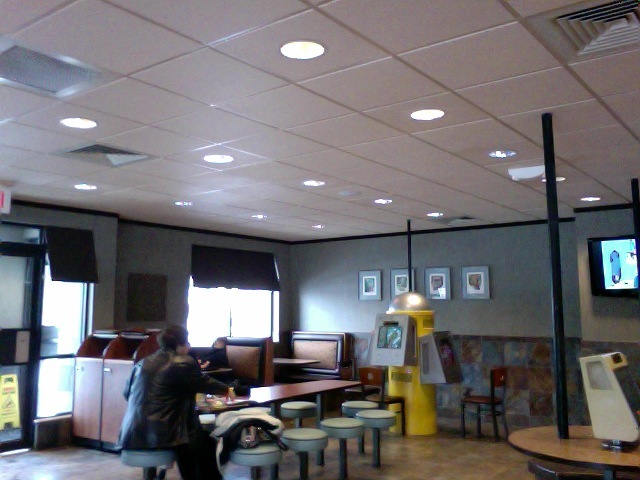 Canton, OH has the coolest McDonalds I’ve ever been to. They’ve got big LCD’s on the wall with the news, and another with Spongebob in the kids area. And touch screen gaming areas. But these machines aren’t just for kids. They’ve got games like zuma and spelling games and trivia that no child would have a chance of answering. In fact I was playing the other night and one of the questions was “How many gallons of beer are in a keg?” Yeah, that might fly in Ohio but that just screams media frenzy back home. The McDonalds has great coffee too. Mochas, cappuchinos, lattes, etc. I was pleasantly surprised. It seems pretty popular too. Had some random guy come to up to me asking questions about my spiffy new MacBook from work. He’s working on an older Mac on the Wifi too. It’s kinda nice working from here. It’s mostly quiet (other than a few occaisional kids) and I can get fresh coffee/hot chocolate or food instantly. The only annoyance is having to pack up all my stuff with me to go to the bathroom since there’s no way I’m leaving my laptop unattended on the table. The temperature is nice and warm inside here too unlike some of the restaurants at home. Considering it’s 14 degrees (F) outside they take heating pretty seriously up here. The only big annoyance is that the signal drops to almost nothing every time they turn on the fry machine. I’ll post about why I’m up here a bit later. Why do I find these beauties AFTER I’m married? * I wish I was your derivative so I could lie tangent to your curves. * If I were an enzyme I’d be DNA helicas so I could unzip your genes.